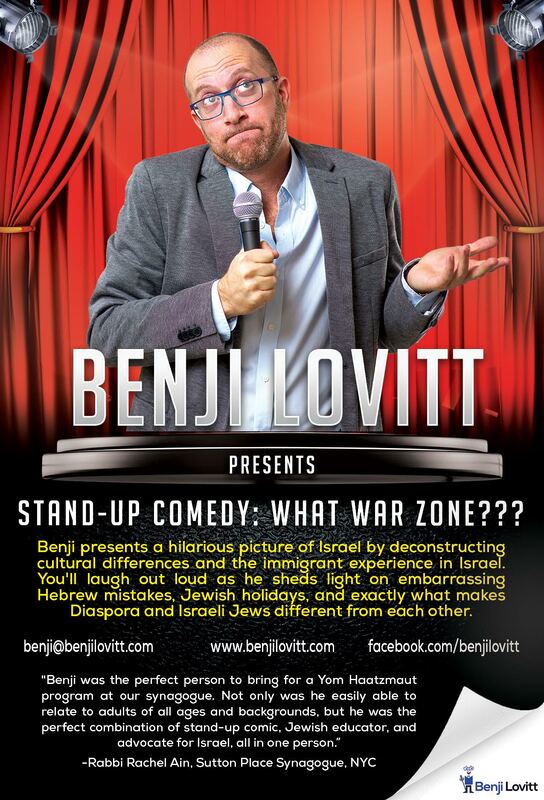 Benji Lovitt’s hilarious stand-up comedy about life in Israel is a must-have user guide for anyone considering a trip to the Holy Land. By deconstructing the details of Israeli culture and the immigrant experience in Israel, Benji’s energy and enthusiasm will make you laugh out loud as he sheds light on El Al security, Jewish holidays, and exactly what makes American and Israeli Jews different from each other. Jewish organizations who have enjoyed Benji’s performance include Jewish Federations, JCCs, Hillel, Masa programs, Birthright Israel, and many more. "My students and faculty alike loved Benji's routine! I highly recommend him for any other group, especially for those who have recently or will shortly experience Israel - it's fun as well as educational too!" "Benji performed at a Yom Ha’atzmaut party we co-sponsored with Masa Israel Journey – he provided us with the perfect, hilarious, low-key Israel-focused program to help celebrate this fun day. The crowd was laughing the whole time, and we practically had to force them out the door at the end of the night! " "Benji performed for a JCC Birthright group of summer camp staff. If there's someone else who does a better job of breaking down the differences between American and Israeli Jews, and in such a funny way, I haven't seen it. They didn't stop laughing for an hour and even the 'serious' conversation at the end was fun and educational. Benji should be a must on every Birthright tour." Benji’s show spans the entire “Israel journey”, from the initial feelings of euphoria when arriving on your first trip (“OMG, everybody’s Jewish!! !”), to the culture clash of a timid American dealing with straightforward Israelis. His performance is non-political, the ideal cultural program to unite people from across the political and religious spectrums and remind us why we love this magical country so much in the first place. 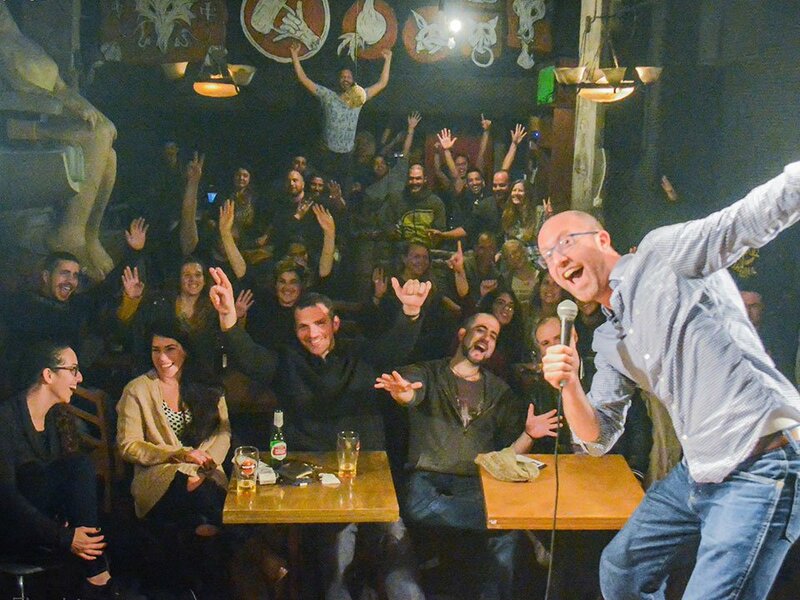 Benji’s show is a perfect fit for Yom Haatzmaut events, Friday night programs, fundraisers, or any excuse to bring your community together to laugh. The comedy show can be followed by a formal or informal Q&A session about modern Israel, travel programs, or why chumus is so much better than hummus. Want to learn more about What War Zone? : Stand-Up Comedy Show?